$95 includes all materials and delicious home-cooked lunch! Spend the day making a punch needle project for your home or gift giving! Learn how to use a punch needle with colorful wool rug yarn to create many types of projects and heirlooms. This method of rug hooking, also known as the “New England Style” has been around for about 150 years. Following a pattern drawn on backing material (monks cloth), yarn is threaded through a punch needle, then poked through the backing. Loops of yarn formed on the front create the design. The end result is similar to traditional rug hooking. Holly will share samples of her work and that of others as an introduction. She has many patterns to choose from to make an 8 x 8 wallhanging, mat or pillow top, or help you create your own design. $9 5 includes all materials and delicious home-cooked lunch! Hand-pulled prints are not reproductions as each impression is individually inked and printed from the same block or set of blocks which have first been designed and carved by the artist. The final design can be expressed in the areas cut away (negative) or on the remaining raised surface (positive) or in both. Bring an idea or simple design to make a 4 x 6 or 5 x 5 image to carve and print from battleship linoleum. Holly will use her own work and that of others as an introduction and will help you problem solve each aspect of the process along the way. Explore the relief potential of collagraphs in combination with linocuts during this two day workshop. Day one will focus on creating a dynamic design using paper, cardboard, string and other materials to make a collagraph block. Using the press, participants will have the opportunity to make embossings and try out various inking options with their collagraph block. Day two will focus on designing and cutting a linoleum block in response to their collagraph image. See what surprises are in when combining the two blocks by layering and overprinting the designs. Materials supply list will be provided upon registration. Cost $175. 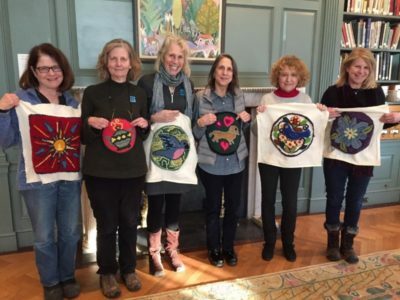 Join Holly at the Coastal Maine Botanical Gardens to learn and experience all the basics of the engaging and meditative art of linoleum block printing! Design, cut and print your own stylized version of a rare or extraordinary plant to make an original work of art. Focus will be on developing cutting techniques to create variety in textures and patterns while striking a dynamic balance between negative and positive areas. Materials list will be provided. Weekend Getaway: Art and Outdoors Combined! Join Holly at The Art Complex Museum in Duxbury for a two day lino cut workshop. Relief printing is the oldest, most direct and low tech method of making an impression on paper. Explore the unique properties and qualities of linoleum as your medium during this two day workshop. You will leave with the information you need to continue making prints on your own! All aspects of the block-printing process will be explored: design, transfer of design to block, cutting, inking, proofing, registration and printing by hand. There will be plenty of opportunity for creative decision making and experimentation along the way!